The moon's battered surface could help scientists understand how life first took root on Earth. Some parts of the moon were so heavily bombarded with small asteroids billions of years ago that the impacts completely shattered the upper crust there, a new study reports. Similar impacts during this same era likely fractured Earth's surface in the same way, generating the types of underground environments that the planet's first life-forms may have exploited, researchers say. "On Earth, we believe that life may have evolved somewhat in the subsurface, and this is a primary mechanism to create subsurface pockets and void spaces, and really drives a lot of the rates at which these processes happen," Soderblom added. "The moon is a really ideal place to study this." Scientists think untold numbers of asteroids and comets pummeled the moon, Earth and the inner planets during an era known as the Late Heavy Bombardment about 4 billion years ago. This catastrophic barrage coincides with the beginning of life on Earth, and some researchers previously suggested these collisions may have provided the energy to jump-start the chemistry of life. The impacts of the Late Heavy Bombardment carved out craters in the lunar crust, opening deep cracks and making it more porous. Just how porous is now becoming clear. Soderblom and his colleagues analyzed the lunar crust using data from NASA's Gravity Recovery and Interior Laboratory (GRAIL) mission — twin spacecraft that orbited the moon throughout 2012, each measuring the push and pull of the other to gauge the moon's gravity. Anything that has mass has a gravity field, and the greater the mass, the stronger the field. Because the mass of the moon is not spread out evenly, this means its gravity field is stronger in some places and weaker in others. Analyzing the moon's gravity field can therefore shed light on how mass is concentrated on the moon. With the GRAIL data, Soderblom and his colleagues mapped the gravity field of the lunar highlands — the most ancient and heavily cratered terrain on the moon. This region is located on the lunar farside. The scientists compared the strength of the moon's gravity field within more than 1,200 craters in the lunar highlands with the gravity of the surrounding terrain. This helped them determine whether the impacts that created those craters increased or decreased the porosity of the lunar crust. Cosmic impacts can increase the lunar crust's porosity by shattering it. However, such collisions might instead decrease porosity by heating and compacting rock. The researchers found that impacts resulting in craters smaller than about 18.5 miles (30 kilometers) wide cracked the upper layer of the moon's crust — a zone about 5 miles (8 km) deep — until it was as porous as it could get. "The moon has gone through so much fracturing that it gets to a point where the porosity of the crust just stays at some constant level," Soderblom said in the same statement. "You can keep impacting it, and you'll hit regions where you'll increase porosity here and decrease it there, but on average, it stays constant." In contrast, larger craters punched deeper into the lunar crust. However, the investigators found that these deeper layers were not as fractured and porous as the upper layers. Although the upper layers of the moon's crust are too fractured to retain much of a record of the collisions from the Late Heavy Bombardment, Soderblom and his colleagues suggest that the deeper layers might provide an idea of how many large impacts the moon and other bodies in the inner solar system suffered during this ancient onslaught. 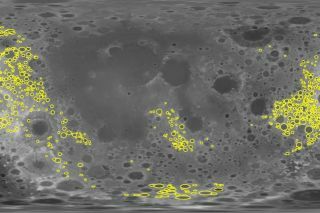 "I personally feel that the greatest implication of this work is the possibility that we might be able to use the subsurface structure of the lunar highlands to learn about the cumulative cratering history of the moon," Soderblom told Space.com. This research could even help scientists track the origins of the rocks that hurled around during the Late Heavy Bombardment. "What we really hope to do is to figure out the number of impacts in the range of 100 kilometers (60 miles) in diameter, and from that, we can extrapolate to the smaller craters, assuming different populations of impactors, and those different assumptions will tell us where the impactors came from," Soderblom said in a statement. "This will help [us] to understand the origin of the Late Heavy Bombardment, and whether it was disrupted material from the asteroid belt or if it was further out." The scientists detailed their findings online last month in the journal Geophysical Research Letters.